Nevada is a dry, desert state in the western region of the country, best known for its largest city of Las Vegas. Although the capital of Nevada is Carson City, virtually all of Nevada's tourism comes from “Sin City,” marked by the iconic Las Vegas strip, bustling with twenty-four-hour nightlife, casinos, and entertainment of every kind, at the fingertips of all who visit. With a population of just under three million people, about two-thirds of Nevada residents live in Clark County, where Las Vegas is located. Unsurprisingly, the rates of alcohol abuse and dependence among individuals aged twelve and older in Nevada significantly outpaced the national rates in 2013, according to the 2014 Substance Abuse and Mental Health Services Administration's (SAMHSA’s) Behavioral Health Barometer. The report also stated that 36.5 percent of the total addiction treatment admissions for the same year were for drugs only, and 44.1 percent were for drugs and alcohol, with 19.5 percent of admissions for alcohol only. Although alcohol is most commonly a problem among Nevada residents when combined with some drug or combination of drugs, the Nevada Department of Behavioral Health reported a sharp increase in alcohol-related deaths from 2014 to 2015. The opioid epidemic plaguing the country is a concern in Nevada, especially in Clark County. According to the National Institution of Drug Abuse (NIDA), Nevada's opioid overdose death rate has decreased over recent years, until an uptick in 2015 that made it equivalent to the national average of 13.3 deaths per 100,000 people, as of 2016. Coincidentally, Nevada providers wrote opioid prescriptions at a rate of 83.0 per 100 people in 2015, compared to the national average of 70.0 per 100 people. According to the 2015 Treatment Episode Data Set (TEDS) report, Nevada treatment admissions with alcohol as the primary or secondary substance of abuse totalled almost two thirds of all admissions, with methamphetamine next, at just under two thirds of admissions, and followed by opioids. 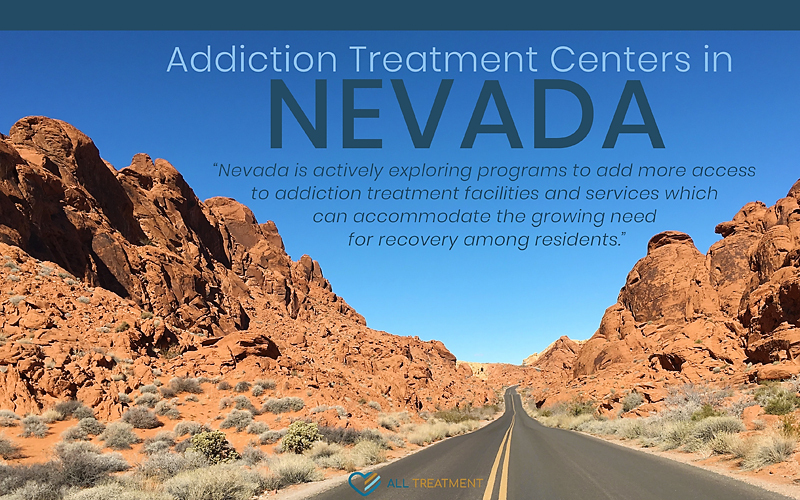 Nevada is actively exploring programs to add more access to addiction treatment facilities and services to accommodate the growing need for recovery among residents.